each player stand opposite each other in a grid in the athletic stance with hamnds on knees . a ball is on the floor 1m from each player between them. players on command of ball have to perform a side lunge before picking up the ball. then squat jump, forward lunge, turn, down and up. 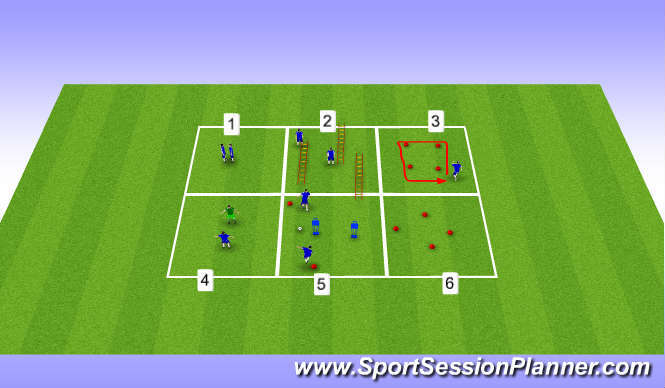 each player facing the same direction proceeds around the box marked out with cones 5m apart. face forwards then left lateral/right lateral and finaly backward, progression is get to do with a ball. 4. a progression from 3 here with a partner perform mirror drill first lateral only player following challenge to stay 1m and no more from opponent, progression is to then move linear and finaly multi directional. progression here as a challenge can you get around your opponent. on command players run in to manequin and touch then drop off back toward cone then pass recieve then repeat as above, this is to start to make more game specific the movements involved. where each player stands next to a cone and the head of the diamond player moves upto 2 paces in any direction always returning back to the middle. # if player turns around then whoever is now facing the front becomes the leader. progression is try to do with a ball- each player has a ball and must do as before but now while controlling the ball.